It was a miserable winter’s day on Jersey when we set off for our Med delivery trip. 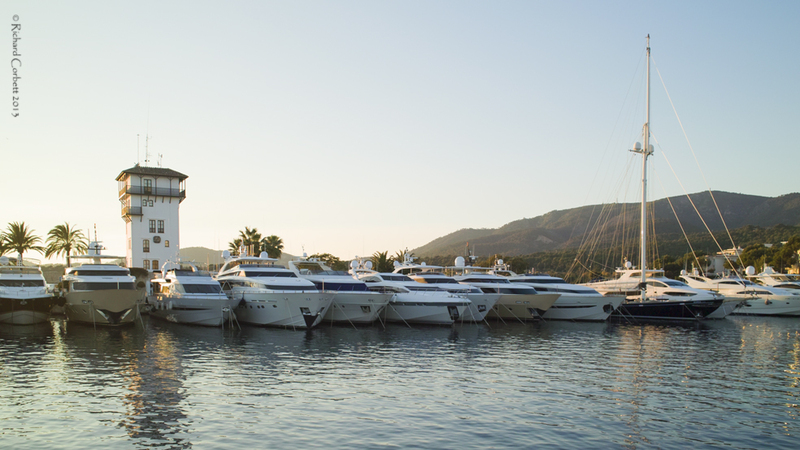 Nevertheless, we were all charged up and ready for an exciting few days delivering a Sunseeker 82 from Mallorca to Genoa. The weather forecast for our trip was quite unbelievable; all the weather sites I was watching indicated little or no wind and possible temperatures in the high teens. Given that it was December and winter had arrived with a vengeance in the UK, this was going to be a very enjoyable few days. After a short hop from Jersey to Gatwick we met up with Tony, our fourth crew member and stayed overnight at the airport hotel for a ‘crack of dawn’ flight to Mallorca. When we arrived at Palma the sun was out and it was definitely milder than the UK – it seems weather forecasting is improving these days. The taxi dropped us in Puerto Portals and it wasn’t long before we’d found our vessel and were crawling all over her. We’d arrived early on the Sunday morning and were planning to depart at 8 o’clock the following morning, so we spent the time we had checking that everything was working, planning the route, fuelling the boat up and making sure the heating was working – as the sun went down it became a tad chilly! So, the next morning we set off. Our route took us around the SW corner of Mallorca and up the channel between Mallorca itself and Sa Dragonera, a beautiful, uninhabited island, which is almost in the shape of a dragon, if you squint a little and have a good imagination for mythical creatures. 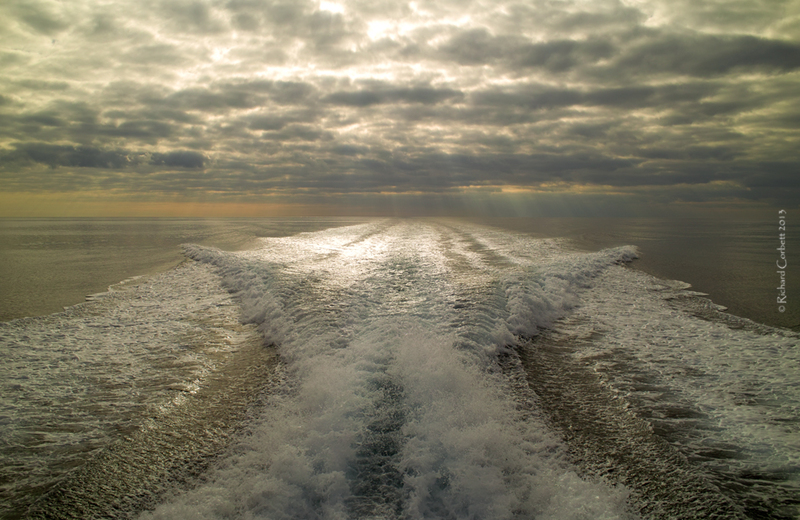 As you can see, the water was like glass and coupled with the gorgeous hull on the Sunseeker 82, it was like gliding through butter – this was definitely going to be a glorious and most enjoyable trip. It was approximately 170 NM to our first stop on the Spanish mainland, Palamos. The crossing took us almost exactly 8 hours, running at around 20 knots. You know, it’s surprising how quickly 8 hours passes by when you’re in good company. We all got along famously and everyone did their bit. I especially like the fact that Davide is a dab hand at cooking – you all know my penchant for food! That first day, Davide prepared us pasta and salad ‘on the hoof’. 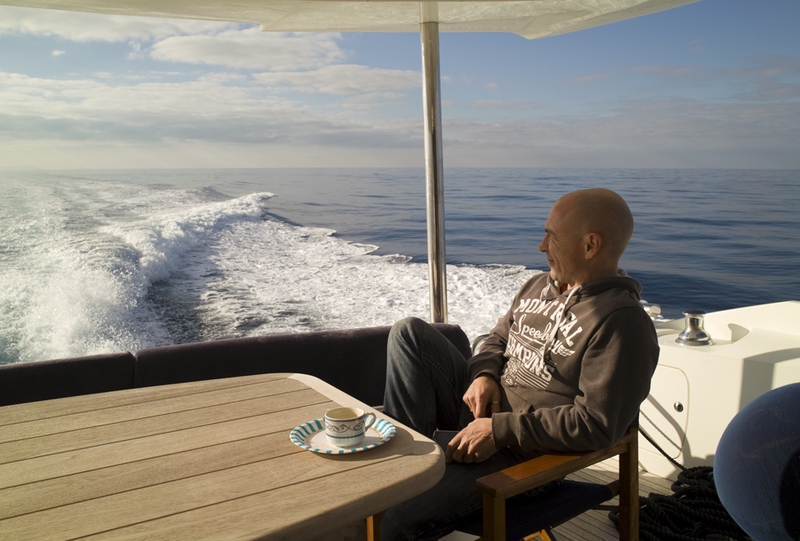 Not only had he cooked lunch at 20 knots but we all took it it in turns to sit at the dining table to eat – this was pure cruising luxury. By the time we’d arrived in Palamos, organised re-fuelling and berthing for the night, it was getting dark. I have to apologise for the lack of pictures of Palamos but there’s not an awful lot to see in Palamos when it’s dark and besides that, we just wanted to get our heads down for an early start the next day. Just before dawn, the local fishing fleet appeared from South of the marina and glided out to their fishing stations in the darkness. I had every intention of beating them out and as such, had arranged to depart at 7 o’clock. Incredibly though, the fleet still managed to beat us out. At the precise moment we started the engines, I noticed the first fishing boat pass the harbour entrance. Then one by one the others followed, until there was huge mass of red and white navigation lights passing the marina entrance and heading North. It seems the next time I go into Palamos I’m going to have to get up even earlier. We slipped the lines, left the dock and headed out into the mass of boats. Our next stop was going to be Beaulieu sur Mer in the South of France but first we had to cross the Gulf de Lyon. A word of advice for anyone attempting to cross this body of water; wait until it is calm. Anything more than a F3 and it is like being in a washing machine. The winds can be very confused and as such, the waves will be too. I remember one trip on a Sealine T60, when we had to pass right around the inside of the bay, hugging the shore as we went. However, this time, the wind was so light that we wafted along at 20 knots, with barely any indication that waves even existed. Normally, in the Med, there’s a good chance you’ll get to see Dolphins and I once saw a whale, which, as regular readers of my Blog you will undoubtedly know but this time we actually saw a shark! I glimpsed it from the helm but soon lost sight of it as it passed down the side of the boat. The others reckoned it was about 9 or 10 feet long and was simply snaking it’s way across the surface of the water at a leisurely pace. I was really pleased to see a shark in the wild. I know, simple things please simple minds and all that but I’m not a huge fan of zoos, despite what they do to preserve endangered species. I prefer to see my wildlife in the wild and this was my first ‘real’ shark! This leg of the journey was a long one. Eventually, we got across the Gulf de Lyon and started to head up the French coast. As we approached the Pettite Passe we were interrogated by French border control but they seemed happy enough with who we were and where we were going. I would like to say at this point, well over 300 NM into the journey, that the boat hadn’t missed a beat. The engines were purring along at 1900 rpm and by now, we were doing a steady 21.5 knots. The autopilot had us on the perfect course and it was simply a matter of keeping watch. With a schedule in place, we all got an opportunity for some time at the helm. 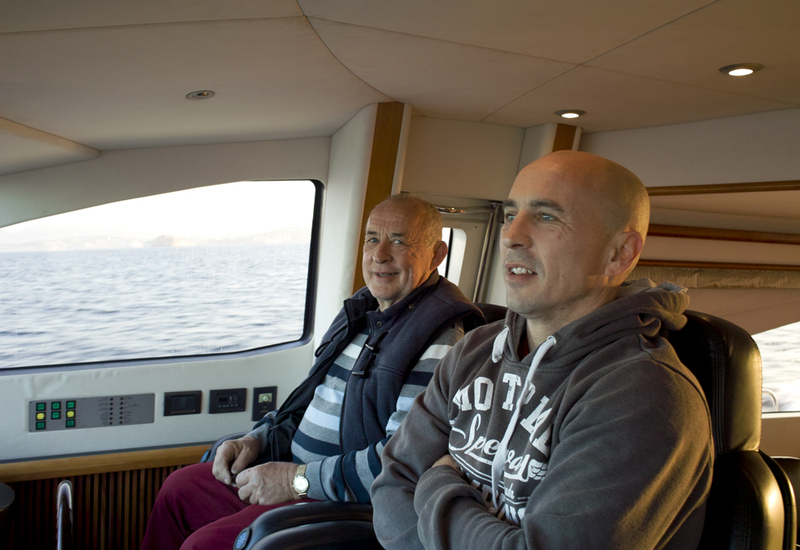 The lower helm can be a little claustrophobic on some flybridge boats but on the Sunseeker 82 it was comfortable and roomy, the visibility was great and all the controls were within reach – well done Sunseeker. 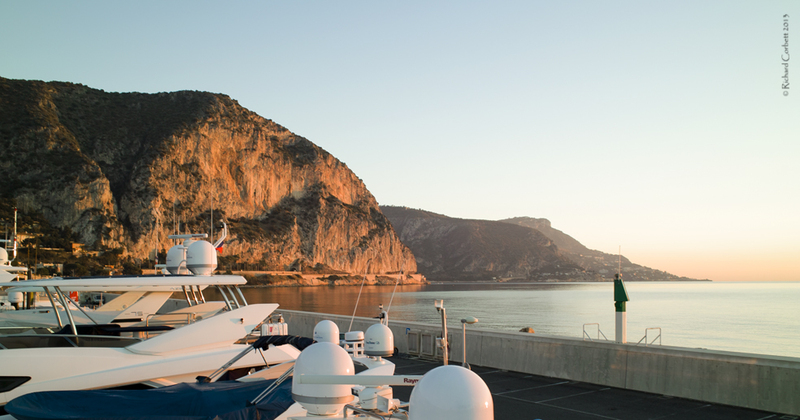 As the sun was dipping into the sea we made a sweeping turn to port around Cap Ferrat and slowed down to enter the harbour at Beaulieu sur Mer. George was waiting for us on the fuel berth and we ‘quickly’ splashed 2000 litres in to get us to Genoa the next day. I have to say, Beaulieu sur Mer is gorgeous. The locals call it ‘Little Africa’ because of the fabulously mild micro-climate they have here. Do yourselves a favour, if you are ever in the locality, whether on a boat or on the land, drop into the port and enjoy the surroundings. It is so pretty and there are a host of wonderful restaurants to while away some hours in. You might drop into Sunseeker Beaulieu and say hello to Mary too – tell her Richard sent you! 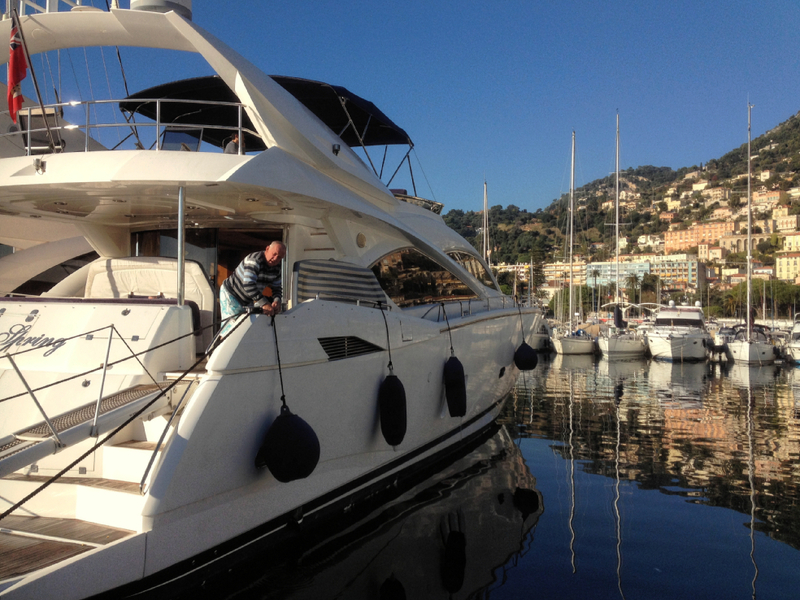 Sunseeker 82, with Lynn doing some seamanship stuff! When we arose the next morning it was another stunning day in paradise. After a quick tidy up, dealing with the berthing dues (France requires original paperwork remember, copies won’t do!) 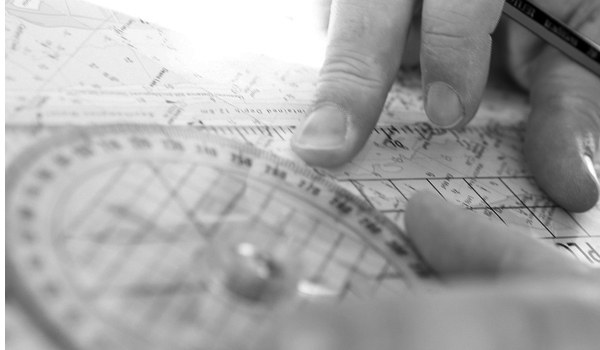 and sorting out the route planning for the passage to Italy, we were off on the last leg of our journey. This was the shortest run of the trip, only 80 NM to Genoa from here. Yet again the sea was super flat and it wasn’t long before we started to see some large commercial vessels heading in and out of Genoa. The port is huge and there is a lot of commercial shipping moving between this part of the Med and the rest of the world. Do make sure you know where you are going when you arrive in Genoa, as ‘Genoa Traffic’ and the port authorities take a dim view of leisure vessels passing through the commercial areas of the port. We had arranged to stay in Marina Molo Vecchio and a quick call on VHF channel 71 caused a rush of helpers to see us safely onto our berth. 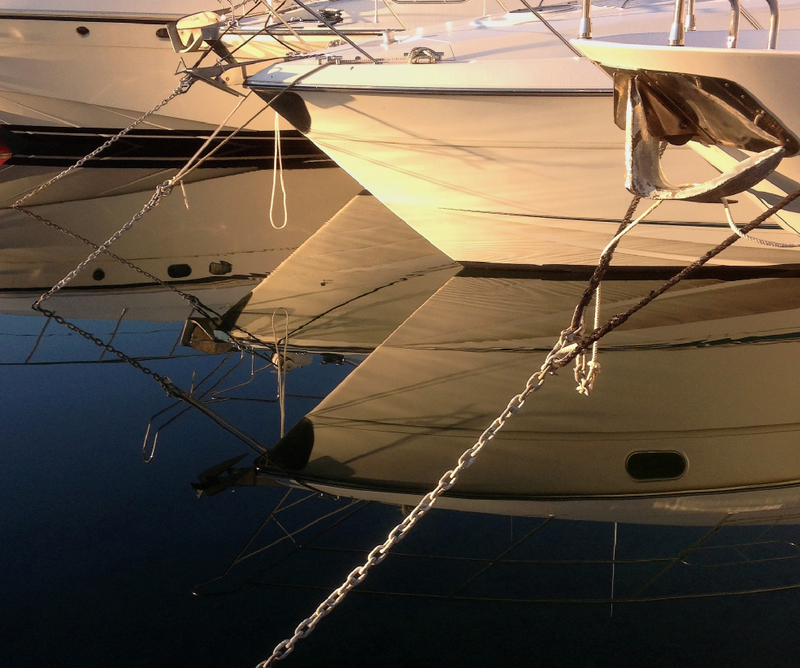 If ever you are in Genoa on a boat, try and get a mooring at this marina. Fabrizia, the lady on the other end of the VHF was so helpful and she speaks excellent English too! One tip though, make sure you give her all the crew details to pass on to Italian Immigration or you will be getting a visit from some very disgruntled officals, so I hear! It was here that we encountered our only hiccup of the journey; a delay with the loading of the boat onto the cradle on which it was to sit during the voyage to her final destination. So the decision was taken to send half the crew back, which left Davide and myself to complete the last job of getting her around to the docks and into the slings. It was sad to see Tony and Lynn leave us, as they had been excellent members of the team but it didn’t really make sense for all four of us to hang around in Italy. We dropped them at their hotel and joined them for a last crew meal before saying our goodbyes and waving them farewell. Friday morning, armed with a piece of paper authorising us to travel into parts of the docks that are normally forbidden to leisure craft and the VHF channel numbers for ‘Genoa Traffic’ and ‘Genoa Pilots’ (why we had to call both, heaven alone knows – you’d think they would talk to each other!) we headed for the dock. 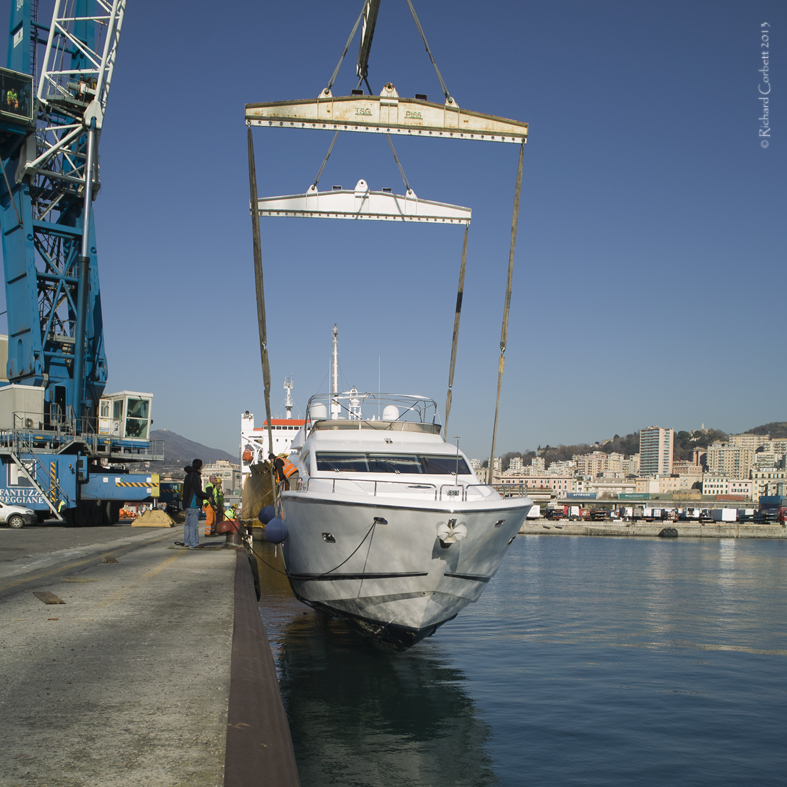 A bitter wind was blowing from the North and despite the cloudless sky it was absolutely freezing on the flybridge as we arrived at Ponte Libia for the lift onto the cradle. Finally, things started to happen. Lifting strops, held by the truly giant crane, were passed under the hull, positioned and then checked by the diver. Then all of a sudden she was airborne! This was essentially our part done. We had safely moved her from Mallorca to Italy and it was now, simply a matter of helping out with straps and making sure the boat was shut down for transport. After a couple of hours of aligning, switching off, strapping and checking, the job was finished and she was ready for her next big adventure. I am very impressed with this boat. She is extremely comfortable and feels very strong and safe at sea. Admittedly, the water was supremely flat but you can tell when a boat is going to perform well whatever the weather chucks at you. This is a perfect cruising boat and will comfortably accommodate 8 people plus crew. The cabins are spacious and well laid out. The socialising spaces are equally well thought out and one of my biggest gripes with modern motor cruisers, the number of spaces at the dining table compared to the number of berths is well attended to. 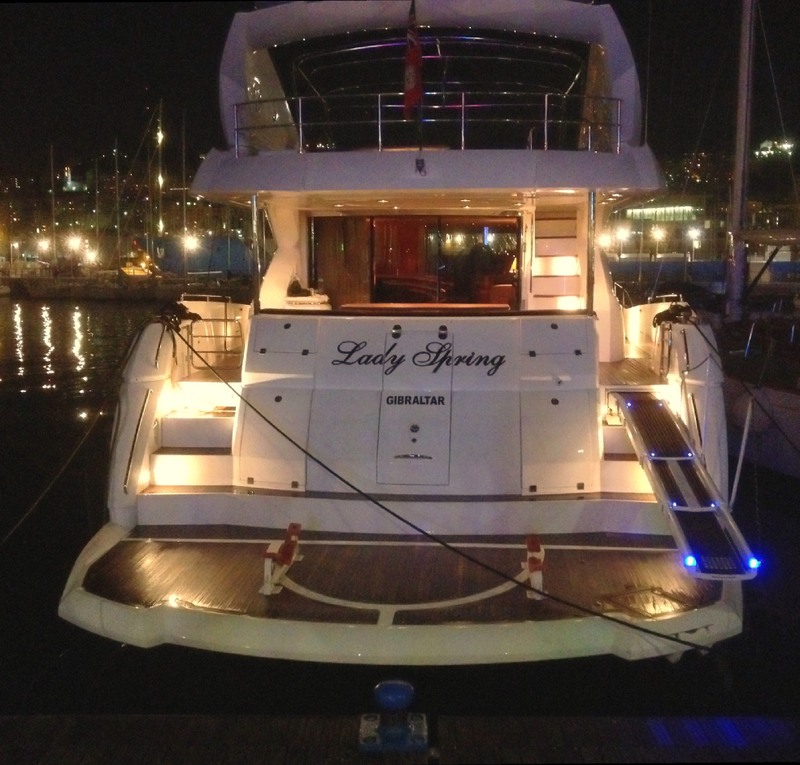 I believe the new owner of this magnificent vessel is going to have many, many happy hours cruising on her.